In Romania's western city of Timisoara, Romanians, Hungarians and Germans have lived side-by-side for centuries. Together, they began the revolution in 1989 which overthrew the communist dictatorship of Nicolae Ceausescu. Today, Timisoara welcomes, or at least tolerates, its new arrivals: thousands of Afghans, Pakistanis, Kurds and Syrians on their way to Western Europe. Some fall in love with the kindness they encounter and end up staying in Timisoara. But most place their lives in the hands of smugglers to reach the West. In October last year, 18 people set out on that journey. It cost the lives of both the smuggler and the young mother of twin girls, and left scars on many of the others. The group set out with a local smuggler guide on 1 October 2017, hoping to cross the border into Hungary on their way to Germany or Italy. Some of them knew each other from Kurdistan. Others met in Timisoara or in the dark, whispering woods and followed each other over the border. For two nights they walked, resting during the day in fields of tall maize. "It was so cold," Aidi told me. "The women and children suffered the most," said Safaa. On the third night, just before 02:00, a Tunisian smuggler in a black minivan with Italian plates picked them up. He hurried them inside and set off for the border. "I think the Hungarian police were already watching us," Murat told me. "They came after us so quickly." When the smuggler saw flashing blue lights in his mirror he shouted at his passengers to get down - and he put his foot on the accelerator. The van smashed into a police roadblock, then hurtled down a motorway embankment. Baran, the mother of nine-year-old twins Hashem and Pasha, died on the spot. The driver died later that day. Hospitals in Szeged and Oroshaza treated the 17 survivors. Hali was in the worst condition. She had a cracked skull, broken ribs, broken arms and legs, and cracked pelvic bones. When I first met her three months after the crash she could sit up in bed, but hardly speak. Her son Safaa, 21, spent all day at her bedside. His father in Iraq and one of his brothers in Germany paid for all the medical expenses, as well as Safaa's cheap accommodation near the hospital. By now the bill was already $10,000 (£7,700), and the family's funds had dried up. Safaa, like all the survivors, praised the excellent medical care given to them. Although the Hungarian government has passed laws criminalising migrants and those who give them aid, the doctors have treated them like victims. Aidi, 20, praised Dr Zoltan, the surgeon who fixed her broken legs when she feared she would never walk again. And a local Baptist pastor, Noemi Nikodem, befriended her in the hospital and became like a sister to her. Hungarian police were less friendly. They were a constant presence in the wards, pressuring doctors to sign papers as soon as the patients were deemed fit enough to face deportation back to Romania. All were sent back to Timisoara except for the orphaned children: Hashem and Pasha, the nine-year-old twins; Horia, a 12-year-old girl travelling alone; Hali because she was too badly injured and Hali's children Safaa and Sonia. It was not the end of the journey for the rest. Still barely able to walk, Akhir stowed away in a lorry in late November. He reached Germany after a 37-hour journey and has applied for asylum. Murat, Khose and 10-year-old Aiman reached Hanover in May. But that was after spending two months in detention in the Czech Republic, when their hiding place in another lorry was discovered. Aidi hid under a blanket in a car that crossed the Romanian border into Hungary at night. 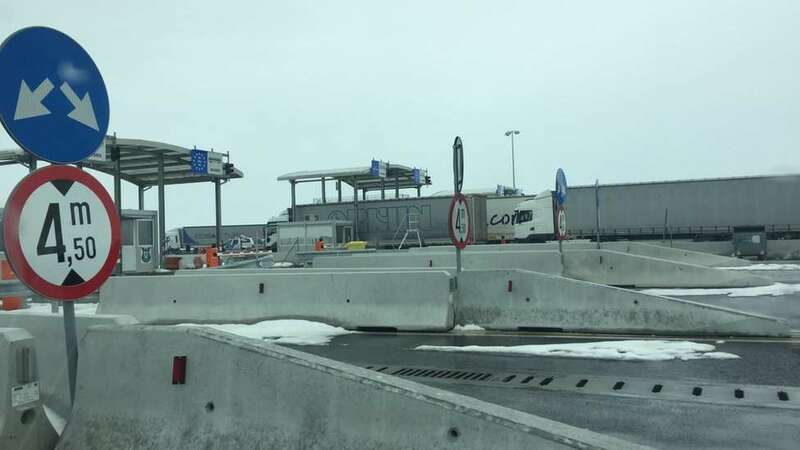 In Timisoara, the rumour is that the smuggler gets $2,000 and the border guards $1,000 for each illicit passenger - something Hungarian police deny. "The Hungarian police pay special attention to the prevention and detection of corruption, and act swiftly against any officer who breaks the law," the police told the BBC. Aidi, now in a temporary home in the German town of Regensburg, told me: "I was so afraid that the police would find me. Or that the car would have an accident again." But she sailed through unscathed, and has now been reunited with her parents and granted asylum. Samir made it to Italy in the back of a truck in April. The twins, Hashem and Pasha, were adopted by relatives in Germany. Horia was taken in by an aunt in Vienna, and could finally leave the children's home where they were placed near Budapest in March. Thanks to the mediation of the UN refugee agency UNHCR, Safaa and Hali have been placed in Hungary's last open refugee camp while German authorities consider their request for family reunification. All the others, contacted by the BBC, confirmed that they had reached Germany. One, Omar, was deported from Germany back to Romania after his asylum request failed. Nine months after the fatal crash, 14 of the 17 survivors have made it to their chosen destinations in Western Europe, though still scarred by the accident. Despite the chorus of politicians pronouncing the Balkan migrant route closed, it is still open - but just a crack.